Early attempts to encourage a viable green construction materials industry in Central Appalachia fell short of the mark. But a new social enterprise is showing success, thanks to a decentralized business model that offers a win-win for everyone involved—especially the region’s small, family-owned forests, sawmills and woodshops. Idled sawmills and wood shops. The numerous small and medium family-owned sawmills and millworks in central Appalachia draw on the region’s abundant hardwood forests. But the depressed housing market and economy of recent years, and steep competition from China, proved devastating. From 2005-11, 19% of the firms closed, nearly 300,000 jobs were lost, and remaining industry slowed to 60% capacity. Green building on the rise. Before the Great Recession of 2008, most Central Appalachian forest landowners, sawmills, millworks companies and contractors had little interest in producing or using green building materials. But demand for certified sustainable wood has grown steadily since then. With poverty on the rise and skilled workers idled, the rising market for green building materials has come to look like the best game in town. Partners with enterprise. Appalachian Sustainable Development (ASD), a regional nonprofit, had long championed use of wood certified as sustainable by the Forest Stewardship Council (FSC). Financial losses had forced ASD to close the sustainable wood products business it launched in the 1990s, but growing demand rekindled their interest. The key question: Could ASD retool its business model to collaborate with a distributed regional network of small, family-owned manufacturers? 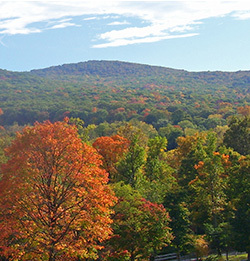 Central Appalachia’s biologically diverse forests are important to the region’s economy. But sustainable management practices are scarce in the region, placing the overall health of the forests at risk. Small family-owned wood firms know their livelihoods are likewise at risk, as is the future of their communities. So when the bright “green” spot emerged in the sluggish construction industry, they took notice. Steadily growing demand for sustainably sourced hardwood products—flooring, ceilings, walls, stairs, moldings, countertops, lumber and custom-milled fixtures—smelled like opportunity. But serving this increasingly lucrative market was no small feat, and most local firms weren’t ready for it. for “chain of custody” certification—a voluntary practice that assures customers that wood products are grown and harvested in ways that protect forests over the long term. Gaining the leading certification, managed by FSC, is complex and costly for most small suppliers. But being FSC-certified would help local mills and shops woo buyers who want to construct LEED-qualified buildings that use best-in-class building practices. So to land LEED buyers, the Central Appalachian firms needed FSC certification. Marketing posed an equal challenge. It’s difficult for each firm on its own to assure the reliability of its chain-of-custody claims, much less handle the cost and time of reaching customers—especially since most green building projects are outside the region. So producing and delivering the product seemed daunting, much less at a competitive price. Still, it seemed their best opportunity. That opportunity was confirmed when locals began to look for—and respond to—actual demand. 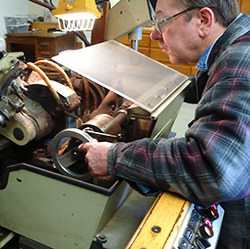 In 2010, Heartwood, Southwest Virginia’s Artisan Gateway, came to ASD with a problem. Heartwood’s design team wanted local hickory for the facility’s new interior. Using the network it had developed, ASD was able to source the desired wood from firms within a 60-mile radius of Heartwood. That local success propelled more examination. ASD learned that U.S. green building starts grew by 50 percent from 2008 to 2010—rising from $42 billion to $72 billion. FSC projected that 25 percent of all new commercial and institutional building starts and 20 percent of residential construction would build green in 2013. Industry analysts expect the value to reach $135 billion by 2015. ASD also found high-volume markets not far from the region. Mid-Atlantic builders would likely buy Central Appalachian sustainable products if the price and logistics were right—and they often have higher-paying customers. ASD and its colleague organizations in the Central Appalachian Forest Alliance began to rethink the business model. The challenge: Figure out how to collaborate rather than compete with small mills and woodworks to reduce costs, market efficiently, serve diverse customers—and preserve local jobs and firms. and supports packaging and logistics for firms in its network—and jointly markets them to green building customers. WoodRight also brokers deals between suppliers and customers. This relieves small firms in its network from having to interpret complex job specifications and manage all the customer relationships. Working with the Center for Forest and Wood Certification at the University of Kentucky’s Department of Forestry Extension, WoodRight also provides certification assistance to forest landowners, loggers, and primary and secondary manufacturers. And it provides carbon offsets through the Appalachian Carbon Partnership, generating proceeds that go to local landowners to promote forest stewardship. WoodRight’s chain of partners and activity is generating new income, preserving rural livelihoods, bolstering the forest industry and improving forest management and resilience. The 2010-12 pilot phase brought in $250,000 in sales. Based on recent sales history, WoodRight projects $475,000 in revenue in 2014 and $875,000 in 2015. Even better, the average wood products industry wages in WoodRight’s 14 most active counties, across five states, now surpass 2010 per capita income by large margins—five by more than 50%, and only three by less than 25%. Significant challenges remain—but so do new opportunities. In five years, WoodRight hopes to top $4 million in annual sales. It is eyeing markets reaching northwest to Chicago, northeast to D.C. and New York, north to Cincinnati and Columbus, and south to Charlotte, Columbia, and Atlanta. It aims to introduce at least 3,000 building professionals to Central Appalachian wood products and to grow the number and quality of regional wood-sector jobs. And it plans to transform, to a cooperative, employee-owned, or other locally owned business model that will keep the new wealth in the region. Overall, WoodRight is quietly and proudly fulfilling its deepest purpose: Steward the use of Central Appalachia’s forest resources to ensure long-term benefit for local people, their livelihoods, and their communities. That’s the real wealth they seek from forests. New green-building practices learned by small firm owners and employees. Developing capacity to provide training in green building materials—with CEU credit—for architects and contractors. Increased industry understanding about marketing to green building markets, FSC certification and chain-of-custody requirements as a competitive advantage. Working networks of private landowners, wood product mills, technical assistance providers, and the core nonprofits that developed WoodRight. New relationships with local and other customers who value high-quality products and service. Eight sawmills with new FSC certification, six more on the way. Carbon offsets and sourcing from nearby mills reducing carbon footprint. Lucrative green markets creating incentive for landowners to manage their forests sustainably. 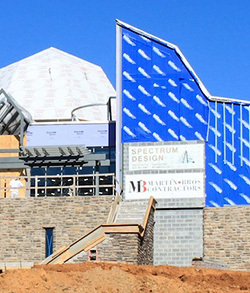 Exemplary green construction, including showcase architecture such as Heartwood, Southwest Virginia’s Artisan Gateway, and the Jubilee Retreat and Conference Center. WoodRight partners actively encourage the Appalachian Regional Commission to invest in a regional sustainable forestry effort. $250,000 in sales generated in WoodRight’s pilot phase—and nearly twice as much expected the next year. WoodRight is a local pilot that plans to transform to local ownership. New business for local firms threatened by 2008 recession and ensuing housing construction crash. New jobs created in several local firms. Workers’ wages steady or rising in firms selling through WoodRight.